Whoa! Check out this Premier Guitar video about the G&L Rampage Jerry Cantrell model. The guitar will be available in Tribute and US-made versions in 2010. Look at the specs of the Tribute version. The US-made version will have a Seymour Duncan JB humbucker and an upgraded Kahler bridge. Former Megadeth guitarist Glen Drover is selling his last ESP guitar, a Custom Shop Eclipse, which was given to him near the end of the Blackmail The Universe tour in 2004. The guitar was also used on Gigantour 2006. The guitar is black with a gold trim and Seymour Duncan pickups. Perhaps most interesting though is that it includes a Kahler 2200 tremolo system. Serious inquiries can contact Glen’s webmaster at mailto://hallowedapparition@gmail.com. Price is US$1,400. Glen will sign the guitar upon request. I’m pretty sure this is a different guitar to the one Glen was selling recently, cos that guitar was descirbed as being given to him before Gigantour 2. Former Megadeth/King Diamond guitarist Glen Drover is selling one of his custom ESP Eclipse guitars made for him during his Megadeth days. 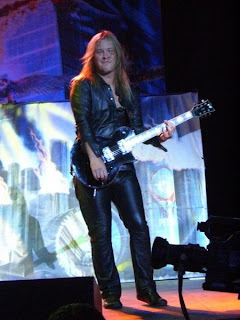 He used the axe on the second Gigantour festival. This would be a great score for a Megadeth fan, but even if you’re not into them it’s a cool opportunity to own an ESP Custom Shop axe with a bit of history. If you’re interested in buying the guitar, contact Glen’s webmaster here. Megadeth’s Dave Mustaine has had more than his fair share of signature guitars – various Jackson models, the ESP DV8 and Axxion, and now the Dean Dave Mustaine VMNT. One thing Dave’s guitars have in common is their aggressive styling – this is not a dude that you’ll see strapping on a Les Paul. The DV8 is not drastically different from the King V-based Jackson Dave Mustaine model of the 90s, and it has a few design refinements including through-body stringing and a tune-o-matic bridge (his Jackson had a fixed Kahler bridge). Most VMNT variants also have Seymour Duncan Dave Mustaine Livewire active pickups. Voiced to sound like a Seymour Duncan JB and Jazz set but with twice as much output, these 9-volt active pickups run on low noise, discrete class A circuitry, and can be operated at up to 25 volts for extremely high headroom. My favourite version of the VMNT is the ‘Angel of Deth’ model, but check out the double neck version of the VMNT too. I guess this one is more of a Flying W than a Flying V.
Check out this wacky little innovation. Ever busted a string on a guitar with a Floyd Rose trem, and been unable to locate an allen wrench to fix it? A company called Strociek has designed the TurboTrem series of replacement whammy bars based on several popular models, with a hidden feature: a 3mm allen wrench built into the base of the bar. Now if you pop a string, just remove the whammy bar and use the screw/push-in end as an allen wrench. Genius! Strociek currently offers 3 models of TurboTrem: threaded, collared, and pop-in. The company says the TurboTrem is compatible with any Kahler tremolo system and all original and licensed Floyd Rose single and double locking tremolo systems, such as the Ibanez Edge series, Schaller, Gotoh, ESP, Peavey, Jackson and Charvel and more. In the world of guitar heroes, Paul Gilbert is the everyman’s shred god. Vai has the alien freak thing down, Satch is the shiny Silver Surfer, and Yngwie is the neoclassical reincarnation of the roadrunner. Gilbert just comes across as a cool guy who loves to rock. With a career spanning classic shred band Racer X, through to Mr Big (admit it, you’ve strummed “To Be With You” on an acoustic guitar around the campfire at least once), covers projects with Mike Portnoy of Dream Theater, and a solo career that’s seen him play everything from jangly guitar pop to all-out metal, with a few classical detours along the way, it’s surprising to note that 2006’s, “Get Out Of My Yard,” was his first all-instrumental album. In October of that year, Gilbert took some time out from defending his yard to tell me all about it. PETER: Why did you wait until now to release an all-instrumental CD, and what inspired you to do it? GILBERT: When I was a kid, all the coolest guitar players were in big rock bands, playing arenas, and being played on the radio. And all these bands had SINGERS. Eddie Van Halen with David Lee Roth, Jimmy Page with Robert Plant, Randy Rhoads with Ozzy, Alex Lifeson with Geddy Lee, Michael Schenker with Phil Mogg… and even Allan Holdsworth had John Wetton. I loved these guitarists, but I also loved their BANDS. So when flashy guitar playing started to become a niche that was aimed solely at an audience of guitar players, I wanted to stay away from it. From the beginning, my band RACER X had singing and songs. MR. BIG, of course, went even further in that direction. And as a solo artist I surprised everyone and went in a pop/punk direction rather than make the shred album that most people were expecting. But as much as I love rock and pop songs, I AM a guitar player. And after playing for 30 years, my guitar had some things to say. So I thought I would quit complaining about the guitar niche and heartily join in by making the coolest CD of pure guitar music I could dream up. PETER: Did you stumble across any cool new techniques during the recording of the album? GILBERT: The first song I recorded was the Haydn symphony. I used my guitar to replicate every instrument in the orchestra. I learned bassoon parts, oboe parts, cello, clarinet, flute, bass, viola, and of course, the main violin parts. The arpeggios and scale sequences in classical music are always a challenge to play on guitar, so I have no choice but to invent some unusual fingerings to make the notes happen. After recording the whole piece, I was definitely warmed up to do the rest of the record! PETER: What happened to the song titles for the album that you originally posted on your website, that when strung together formed a paragraph about pesky kids in the yard? GILBERT: Ahh! You saw that! I thought that would really cool at first, but I couldn’t remember which song was which, so I went back to my original titles. PETER: What guitars did you play on the album? GILBERT: I used an Ibanez PGM300 with a Kahler tremolo on it. I haven’t used a whammy in a long time and it was fun to try it again. You can hear that guitar on the solo in “The Curse of Castle Dragon”. I also used it on the main parts of the Haydn symphony. I have a custom Ibanez doubleneck that I used for the opening “Get Out of My Yard” solo. One of the necks is strung with just 3 strings, all tuned to “E” in octaves, low, middle, and high. This is really good for playing arpeggios with hammer-ons and pull-offs. I used this tuning with a capo in a bunch of different positions to make the intro happen. I also have some vintage Ibanezes that I really like: a ’79 hollowbody Artist, a ’77 Deluxe 59’er Les Paul copy, and a ’77 SG Custom copy. I bought these all on ebay. They are killer! PETER: Will there be any new PGM Ibanez models in the near future? GILBERT: I just got a new prototype with a narrower fingerboard and three gold covered humbuckers. It’s really cool! For something to become a production model, I would really have to become my main guitar. And the current PGM301 is still hard to beat. PETER: How did you get to be so damn good on the guitar? Do you practice a lot these days, or do you not need to any more? GILBERT: Thank you the compliment. I don’t practice ALL the time, but often enough. I definitely had to practice for the Haydn symphony! PETER: What’s the strangest place you’ve heard one of your songs played? GILBERT: The first thing I can think of is… a few years ago I was doing a guitar clinic… I think it was in Kansas. A kid who worked at the music store picked me up from the airport, and as soon as we got in his car he turned on his stereo and starting listening to “The Jam”. This the last song on my first solo album “King of Clubs”. It’s a 20 minute long guitar battle where the rhythm section basically never changes, and Bruce Bouillet and I just solo and solo and solo and solo. So, back the story… the song was about 17 minutes into it when he turned it on. That meant he had already made it that far. And then, 3 minutes later, the songs ended… and STARTED AGAIN. He had the thing in “loop” mode. 20 minutes of non-stop soloing was NOT ENOUGH for this kid. He needed it AGAIN. Insane. PETER: Godzilla is tearing apart the city. You have time to save one guitar before he eats the rest. What guitar will it be? GILBERT: At the moment, I really love my ’79 Artist hollowbody. I haven’t played hollowbodies much before but the thing just resonates so beautifully. Even at a low volume I get great feedback and sustain. Plus it’s BIG and since I’m very tall it’s nice to have a guitar that’s more my size. Maybe, armed with this guitar, I could fight off Godzilla and preserve the rest of my guitar collection. I would certainly try. Click here to buy ‘Get Out of My Yard’ on CD. Click here to buy ‘Silence Followed by a Deafening Roar’ on CD.